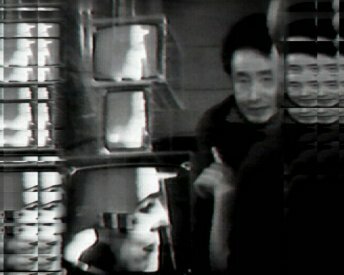 In March 1976 Nam June Paik and Charlotte Moorman arrived in Australia for John Kaldor’s Public Art Project 5. 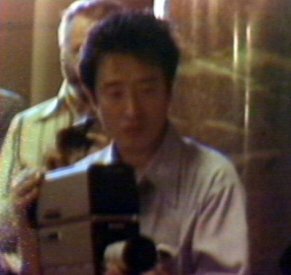 Paik is regarded as the “father of video art”. Moorman was the organiser of the New York Avant Garde Festival, and had been working with Paik on various projects for about ten years. Moorman arrived slightly before Paik and gave a press conference at the Sebel Town House. At the press conference, John Kaldor introduced her and she talked about her work, about the TV Bra, and about having been trained at the Julliard School of Music and not being allowed to play a John Cage piece for her graduation performance. She also thanks the sponsors as well as Ron Muller and Mario Fairlie of the Paddington Video Access Centre for building the TV Cello to be used in Australia, and for their help in adapting the TV Bra to Australian power. She then gave a short performance of the TV Bra. 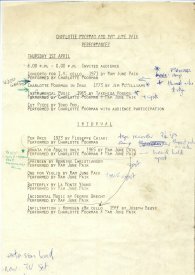 Their first engagement was at the Adelaide Festival (21–24 March 1976), after which they returned to Sydney and began their 11-day presence at the Art Gallery of New South Wales (AGNSW, 1–11 April 1976). In the period prior to their arrival, Ron Muller at the National Resource Centre for the Video Access Network (based at City Video in Oxford Street, Paddington, Sydney; aka The Paddington Video Access Centre) had built a new version of Paik’s TV Cello to plans supplied by Paik, and which he approved on a visit to the centre. 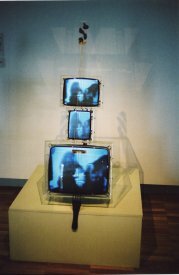 Works shown in the AGNSW were TV Bra, TV Bed, TV Garden, TV Buddha and TV Cello, along with photographs and documentation of their performances2. 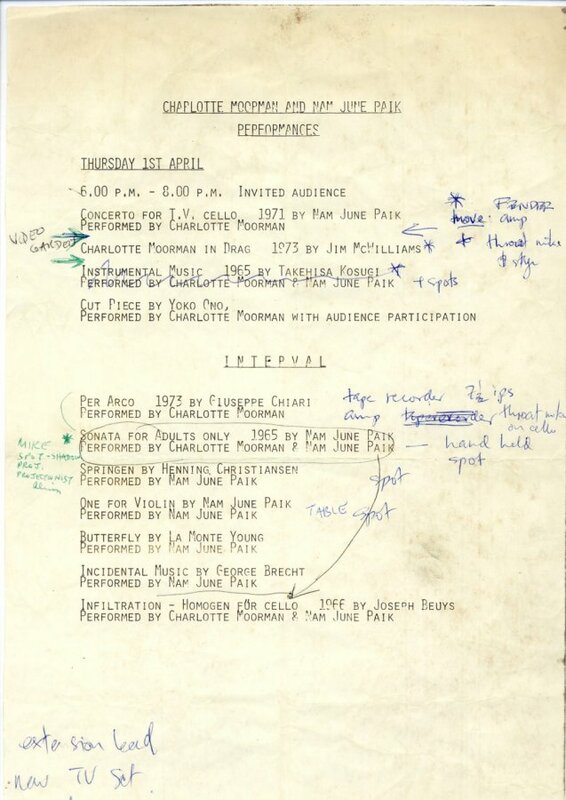 They also presented a series of performances, variously composed by Paik for Moorman, and by many other avant garde composers for each of them. Many of these were in the style of Fluxus, with whom Paik had had considerable involvement since 1961. 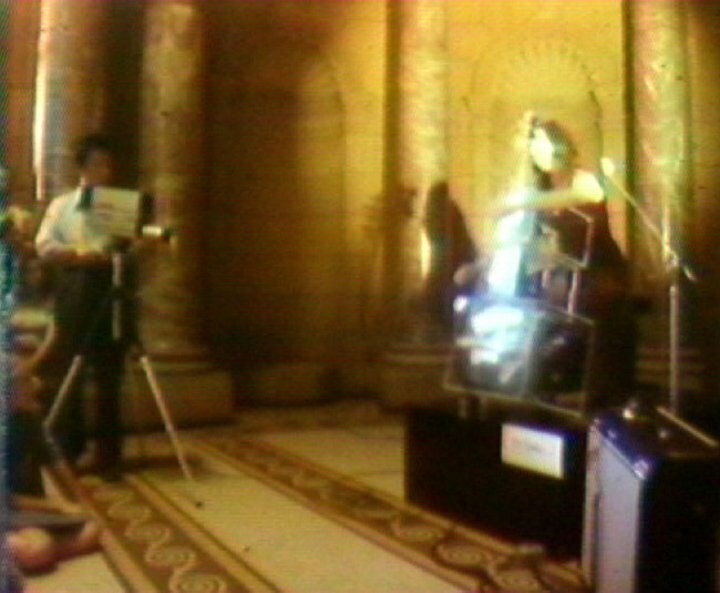 Moorman played the TV Cello, which was set up in the entrance foyer of the gallery. She also performed with the TV Bra. TV Cello consisted of three video monitors stacked one on top of the other, each encased in perspex and with a perspex cello-like ‘neck’ rising from the top case. The monitors were selected to imitate the shape of a cello, with a 20-inch screen at the bottom, a 9-inch screen set on its side as the middle, and a 14-inch screen, laid normally, on the top. A cello bridge was set in the centre of the lower monitor and the whole ‘cello’ was strung with bass strings running from the cello binding posts in the top of the neck to the standard tongue-like end piece which was attached to its plinth. Thus it could be played with a bow, much as a regular cello. Moorman’s daily performances involved her playing the TV Cello for its own kind of sound, while Paik used a video camera to relay images of both the audience and the performance to the cello screens. This, the third edition of the TV Cello (originally built in 1971) was constructed at Paddington Video. It is now held by the AGNSW as part of the John Kaldor Family Collection. The TV Bra for Living Sculpture (1968–9) comprised a pair of small video monitors protruding from a plastic brassiere strap that Moorman wore over her breasts. 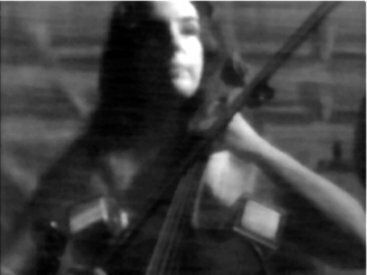 She would play her own cello when using the TV Bra and, as with the TV Cello, the images were from a camera operated by Paik. The deflection circuits in the TV Bra monitors had been altered so that the sounds Moorman made while playing the cello would modulate the image on the monitors, twisting it into a vortex. She could control the amount of this effect with a foot peddle. 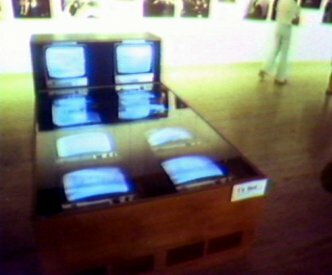 The TV Bed was a large wooden box set up as a bed and bed-head, the size of a double bed, each with a clear perspex cover, and about the depth of a large video monitor. It contained eight 19-inch TV sets in the base and a pair in the head, each tuned to local TV channels. Moorman would lie on the bed and play her cello or sit on it and chat to members of the audience. The TV Garden (1974) occupied a substantial part of the gallery space dedicated to the exhibition. It was in a separate, walled-off rectangular space with a walkway along one of the long sides. Inside the space were approximately 20 TV sets connected to a U-matic video player which showed Paik’s psychedelic adventure Global Groove (1973). The sets were surrounded by potted plants and small shrubs, simulating a ‘garden’ embedded with large brightly glowing jewels. 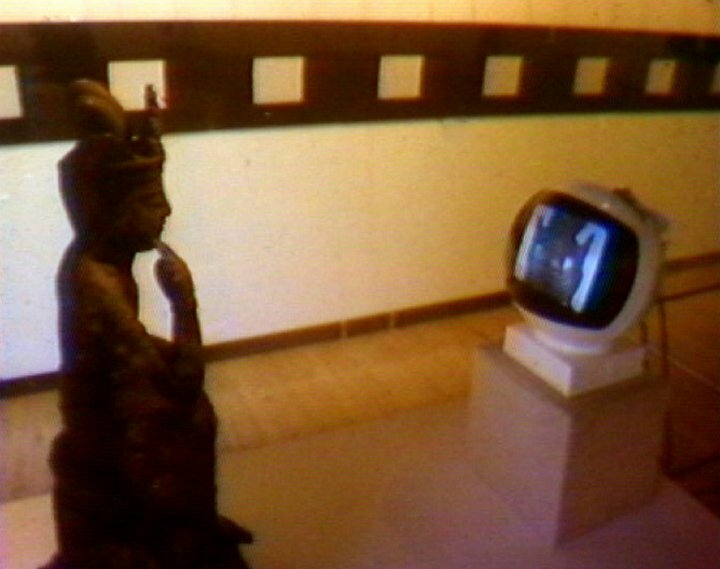 The TV Buddha was installed in a space towards the back of the main exhibition area, and off to the side. Paik said at the time that he had found a JVC Videosphere TV set in a secondhand shop in Kings Cross. John Kaldor provided a small Buddha statue.3 The Buddha is set on a plinth, facing the spherical TV which is also set on a plinth, and a black & white video camera is set behind the monitor and focused on the Buddha’s face. The camera output is lead to the TV. Thus the Buddha is contemplating its own image on the screen in a kind of convoluted meditational feedback. It is a consummate example of Paik’s work. • La Monte Young’s Butterfly, in which Paik stands on stage and releases a butterfly into the air. It flutters around the stage for a while as Paik watches, and then flies off, thus ending the piece. • Incidental Music, by George Brecht. In the first movement, Paik builds a tower of children’s blocks on the strings of an open grand piano, placing each one carefully until the tower becomes unstable and collapses, spilling the blocks across the strings and thus producing a random chord. In the second movement Paik takes a roll of sticky tape and applies a strip of tape to a key on the piano keyboard. He then cuts the tape leaving the key taped in position. • Yoko Ono’s Cut Piece. Moorman sits on stage in a long dress. The audience is told that they may come up to and with a pair of scissors make one cut in the dress. Daniel Thomas is there to make sure the rule is followed. Her dress and underwear are cut piece by piece until Moorman decides to call a halt. • Infiltration — Homogen für Cello, by Joseph Beuys: Paik is seated cross-legged on stage with Moorman’s cello contained in a form-fitting felt cover resting upright in his hands. Moorman walks on, kneels down at the cello and proceeds to take a red strip of cloth, pinning it vertically onto the cello felt. She then takes a second strip of red cloth and pins it horizontally across the previous strip so that the two form a cross. On finishing she rises and lifts the cello from Paik’s hands. He then stands and they both walk off stage. 1. 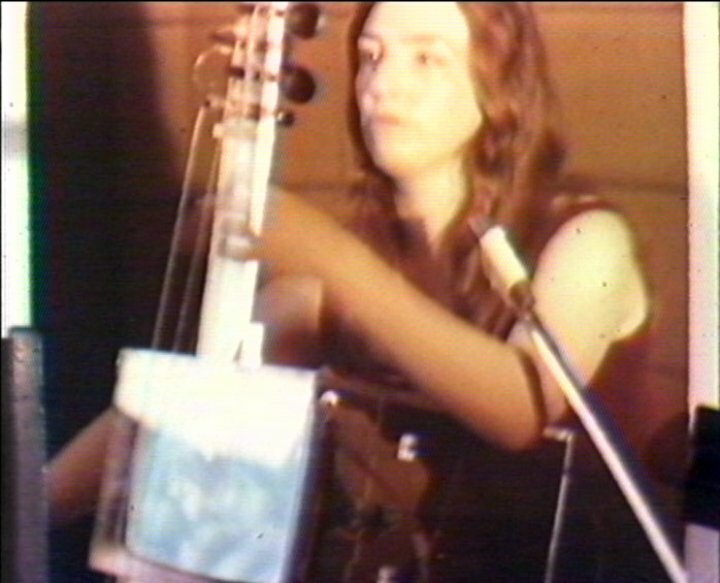 Charlotte Moorman quoted in the video Hunting for the Future, edited and compiled by Stephen Jones from videotape shot by Michael Pursche and Richard Maude. 2. The author was technical attendant during the exhibition. 3. This statue is of a figure in what is generally called the ‘pensive pose’, one leg supported on the knee of the other, which is pendant. The fingers of the hand of the arm resting on the knee of the supported leg are held gently against the face and the torso leans slightly forward thus giving the image of a person in deep contemplation. The crown and the jewellery suggest that it is a Bodhisattva, probably a Maitreya — the Buddha of the future, which is, of course, appropriate for Paik. It is Japanese, from Kyoto, although it is based on an earlier Korean model, and was dedicated to the artwork by Kaldor. 4. The quotes are from the video Hunting for the Future, edited and compiled by Stephen Jones from videotape shot by Michael Pursche and Richard Maude. 5. For further information on the exhibition and the series of performances see: 40 Years: Kaldor Public Art Projects, ed. 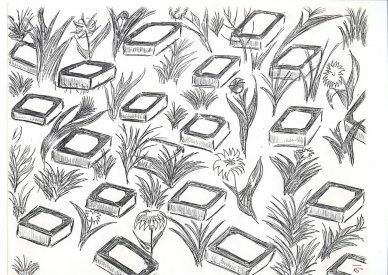 Sophie Forbat, Kaldor Public Art Projects, Sydney, 2009; “A Transgressive Duet”, Rhana Devenport, Art and Australia, Vol. 43, No. 1, Spring 2005; “Moorman and Paik in Australia”, Daniel Thomas, Art and Australia, Vol. 14, No. 1, July–Sept 1976. Charlotte Moorman performing the TV Cello in the entrance hall of the AGNSW.